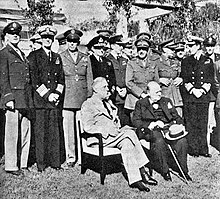 The Casablanca Conference (codenamed SYMBOL) was held at the Anfa Hotel in Casablanca, French Morocco, from January 14 to 24, 1943, to plan the Allied European strategy for the next phase of World War II. In attendance were United States President Franklin D. Roosevelt and British prime minister Winston Churchill. Also attending and representing the Free French forces were Generals Charles de Gaulle and Henri Giraud, though they played minor roles and were not part of the military planning. Premier Joseph Stalin had declined to attend, citing the ongoing Battle of Stalingrad as requiring his presence in the Soviet Union. The conference agenda addressed the specifics of tactical procedure, allocation of resources, and the broader issues of diplomatic policy. The debate and negotiations produced what was known as the Casablanca Declaration, and perhaps its most historically provocative statement of purpose, "unconditional surrender". The doctrine of "unconditional surrender" came to represent the unified voice of implacable Allied will—the determination that the Axis powers would be fought to their ultimate defeat. The conference produced a unified statement of purpose, the Casablanca Declaration. It announced to the world that the Allies would accept nothing less than the "unconditional surrender" of the Axis powers. Roosevelt had borrowed the term from General Ulysses S. Grant, who had communicated that stance to the Confederate commander at Fort Donelson and Fort Henry during the American Civil War. In a February 12, 1943 radio address, Roosevelt explained what he meant by unconditional surrender: "we mean no harm to the common people of the Axis nations. But we do mean to impose punishment and retribution upon their guilty, barbaric leaders". Behind the scenes, the United States and the United Kingdom were divided in the commitment to see the war through to Germany's capitulation. Some source material contradicts the official reported accord between Churchill and Roosevelt, indicating that Churchill did not fully subscribe to the doctrine of unconditional surrender. New York Times correspondent Drew Middleton, who was in Casablanca at the conference, later revealed in his book, Retreat From Victory, that Churchill had been "startled by the [public] announcement [of unconditional surrender]. I tried to hide my surprise. But I was his [Roosevelt's] ardent lieutenant". According to former U.S. Ambassador to Moscow Charles Bohlen, "Responsibility for this unconditional surrender doctrine rests almost exclusively with President Roosevelt". He guessed that Roosevelt made the announcement "to keep Soviet forces engaged with Germany on the Russian front, thus depleting German munitions and troops" and also "to prevent Stalin from negotiating a separate peace with the Nazi regime". That the war would be fought by the Allies until the total annihilation of enemy forces was not universally welcomed. Diplomatic insiders were critical that such a stance was too unequivocal and inflexible, would prevent any opportunity for political maneuvering and would be morally debilitating to French and German resistance groups. The British felt that arriving at some accommodation with Germany would allow the German army to help fight off the Soviet takeover of Eastern Europe. To Churchill and the other Allied leaders, the real obstacle to realising that mutual strategy with Germany was the leadership of Adolf Hitler. Allen Dulles, the chief of OSS intelligence in Bern, Switzerland, maintained that the Casablanca Declaration was "merely a piece of paper to be scrapped without further ado if Germany would sue for peace. Hitler had to go". There is evidence that German resistance forces, highly placed anti-Nazi government officials, were working with British intelligence, MI6, to eliminate Hitler and negotiate a peace with the Allies. One such man was Admiral Wilhelm Canaris, head of German intelligence, the Abwehr. His persistent overtures for support from the United States were ignored by Roosevelt. Roosevelt, with advice from General George C. Marshall, the U.S. Army Chief of Staff, lobbied for a cross-Channel invasion of Europe. Churchill, with advice from the British Chiefs of Staff, led by General Sir Alan Brooke, the Chief of the Imperial General Staff (CIGS, the professional head of the British Army), felt the time was not opportune, and favored an Allied assault on the island of Sicily followed by an invasion of mainland Italy. The British argument centred on the need to pull German reserves down into Italy where, due to the relatively poor north-south lines of communication, they could not be easily extracted to defend against a later invasion of northwest Europe. Additionally, by delaying the cross-Channel landing, it would mean that any invasion would be against a German army further weakened by many more months fighting on the Eastern Front against the Red Army. Throughout the conference, Roosevelt's attention was prominently focused on the Pacific War front and he faulted the British for what he felt was not a full commitment against Japanese entrenchment. The Italian strategy was agreed upon, a compromise between the two leaders, Roosevelt acceding to Churchill's approach for Europe. Churchill, in turn, pledged more troops and resources to the Pacific and Burma to reinforce positions held by Chiang Kai-shek against the Japanese. The United States would provide assistance to the British in the Pacific by supplying escorts and landing craft. 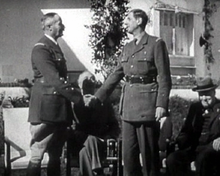 Leaders of the Free French forces: General Henri Giraud (L) and General Charles de Gaulle (R) at the Casablanca Conference. Charles de Gaulle had to be forced to attend, and he met a chilly reception from Roosevelt and Churchill. No Frenchmen were allowed to attend the military planning sessions. The conference called for the official recognition of a joint leadership of the Free French forces by de Gaulle and Henri Giraud. There was notable tension between the two men, who limited their interactions to formalities like pledging their mutual support. Roosevelt encouraged them to shake hands for the photographers eager for a photo opportunity, but the ritual handshake was with reluctance and done so quickly that they purportedly had to pose for a second shot. Roosevelt would later describe this meeting between the French leaders as a "shotgun wedding". In Elliott Roosevelt’s book, As He Saw It (1946), Elliott describes how Franklin Roosevelt wanted the French provisional government to be set up with Henri Giraud and Charles de Gaulle, “equally responsible for its composition and welfare.” (89) This is because Franklin Roosevelt saw Charles de Gaulle as Churchill’s puppet, and Roosevelt thought Giraud would be more compliant with US interests. Complications arose with this because most people in the French Resistance considered de Gaulle the undisputed leader of the Resistance, and therefore Giraud was progressively dispossessed of his political and military roles. Roosevelt eventually recognized de Gaulle as the head of the Free French in mid-1944. The day before, Roosevelt became the first US President to visit the African continent by staying over at the city of Bathurst, Gambia. The abhorrent situation of the locals further increased his anti-colonialism leading him to further discuss and impress upon Churchill the need for an international trusteeship system that would advance colonies like Gambia towards independence. This disposition of the Jewish population harkened back to a mindset communicated in earlier years to Roosevelt by the American ambassador to Germany, William Dodd (1933–37). Dodd had appraised Germany's repression of Jews, and writing to Roosevelt, he said: "The Jews had held a great many more of the key positions in Germany than their number or talents entitled them to." Roosevelt presented the results of the conference to the American people in a radio address on February 12, 1943. ^ Michael Howard, Grand Strategy, IV, August 1942–September 1943 (1972) pp 279-81. ^ Pratt, Julius W. “De Gaulle and the United States: How the Rift Began.” The History Teacher, vol. 1, no. 4, 1968, pp. 5–15, p. 11. ^ Roosevelt, Elliott (1946). As he saw it. With a foreword by Eleanor Roosevelt. [On F.D. Roosevelt.] New York. OCLC 504739143. ^ "That Hell-hole Of Yours". www.americanheritage.com. Retrieved 2018-06-04. ^ "The American Experience.America and the Holocaust.Teacher's Guide - PBS". Appleby, Simon. "SYMBOL: Churchill, Roosevelt, and the Casablanca Conference, January 1943." (PhD Dissertation, University of Cambridge 1998) online. 73pp; with bibliography pp 64–72. Armstrong, Anne. Unconditional surrender: the impact of the Casablanca policy upon World War II (Rutgers University Press, 1961). Howard, Michael. Grand Strategy, IV, August 1942–September 1943. (1972). pp 239-88. Lacouture, Jean. De Gaulle: The Rebel, 1890–1944 (1990) pp 416-29.